Vietnam highlights » Vietnamese Cultures » How to Dress in Temple, Myanmar? 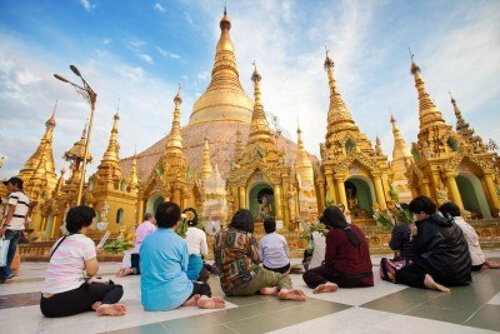 Thanks to its magical beauty, Myanmar attracts many visitors to visit the temples. However, there are some notes about selecting clothes when entering temples in Myanmar, which might be useful for visitors. Our Myanmar travel experience will be shared to you about this to help you enjoy your trip to Myanmar. You should remove shoes, sandals and socks when visiting temples and areas where shoes are not allowed. You should follow the instructions of your local guides to know where to start removing your shoes. It is the first attention about clothes when entering the temples in Myanmar. Some temples allow visitors to bring footwear into the temple grounds but don’t allow to bring it into the temple. Most of the pagodas require visitors to remove sandals from the gate. You should also remove sandals outside the home when visiting Myanmar people, but socks are allowed to wear. Therefore, you should wear sandals that are easy to remove and bring in, carry wet paper to clean feet before wearing footwear again. Burmese usually wear flip-flops, slippers or sandals because of that. - When you give money, gifts or anything else to others, you should use your right hand or with both hands to show politeness. - Some places in temples, or temple areas, especially solemn and sacred areas, women are not allowed to enter. You should check with your local guide to be sure you are in the right position. Women should not sit on top of a car or roof, roof of the boat, etc., meaning sitting above someone else's head. Women are also not allowed to touch, or shake monks’ hands in any form. If you unfortunately touch them, please apologize and the other monk will surely feel guilty when touched. In Myanmar, only men can be monks. - If you wear traditional costumes of Myanmar, you should dress appropriately. 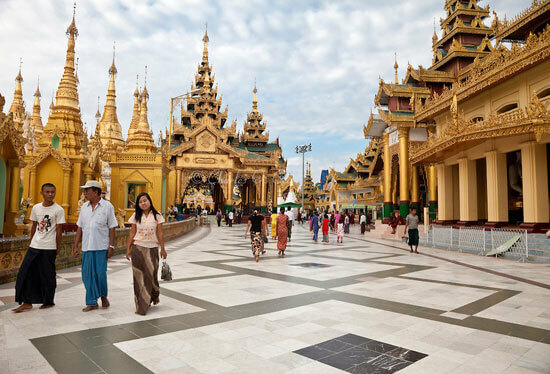 You must wear long pants over the knee and shirt when visiting the temples of Myanmar. • Clothes are lightweight, less ironing, can be wore long: the best is jeans and T-shirts or cool cotton clothing. Please bring along over-the-knee pants and polite tops to visit the temple. • Shoes: lightweight, easy to remove to bring on the tour because you have to take off shoes when going to the temple. • Medium and lightweight backpack: For 2 days-1night to Golden Rock, the rest of the costume should be stored at the foot of the mountain on your car, or stored at your hotel. • Personal snacks when it’s cold. • Individual medicine: medicines for stomachache, flu, oil and medicines for your disease, if any. Myanmar is an underdeveloped country so all medicines are imported.